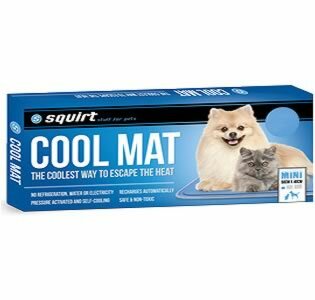 Keep your dog cool on hot summer days or warm nights with the Squirt Cool Mat. Made from pressure activated gel, the surface of the Squirt Cool Mats stays cooler than the ambient temperature for up to 3 hours. The gentle cool in this soft and smooth mat is ideal for use all year round to sooth aching muscles and ageing joints. The Squirt Cool Mat is an easy and safe option for as it does not require any power source to operate, so there are no dangerous wires or batteries that your dog can chew through. 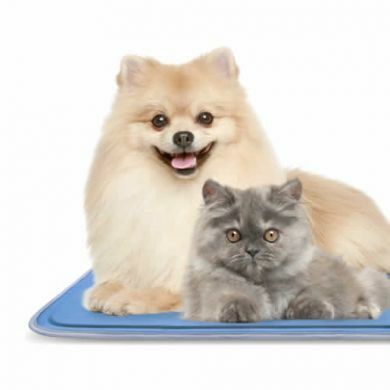 The Squirt Cool Mat is great for travel as it conveniently folds for easy storage or to fit into a crate or dog house. Place the Cool Mat in a convenient location, avoiding direct sunlight, heat or hot air to improve its performance. You can speed up the recharging process by placing the Cool Mat in icy water, a refrigerator or freezer. Please note: The Cool Mat will stiffen when frozen, but will become flexible again as it defrosts. For an easy clean: Wipe the Cool Mat clean with a damp cloth. For a thorough clean: Clean with warm soapy water and allow the Cool Mat to dry completely before storing. Do not machine wash or tumble dry. Store with fabric between the folds to avoid mould forming on the Cool Mat. Store the Cool Mat in a cool, dry, ventilated place.